Sour Grapes recently had an opportunity to chat in depth and sample with several winemakers from Spain, Italy, France and Portugal at the recent Artisan Collection Portfolio tasting in New York. A couple of our customers met us at the tasting as well and we all had some favorites from the tasting. We continue to be selling more and more Italian wine and maybe it has to do with the access we have to great estates like Forchir. Paolo Baj, the winemaker at Forchir in the Friuli region of Italy, who is renowned for making perfumed, focused and pure white wines such as Pinot Grigio, Riesling, Sauvignon Blanc, Tocai Friulano and Ribolla Gialla. He is as passionate and as genuine as any Italian elder in the wine business you will ever come across. We spoke about the crazy, cold weather in the USA and how he hesitated to travel here after seeing the lows in all of the cities he was expected to be in over the next week. We spoke about private labels of the past, new directions of Forchir wines in the future and we both agreed how great his Tocai Friulano 2013 is drinking now and will be down the road. He likes to make trips to San Daniele right around the corner for the gorgeous ham they produce there and was adamant about taking me when i visit. He laughed aloud and said Tocai was his favorite white that he produced and that he would sell a hell of a lot more if it were labeled Pinot Grigio. Paolo was very excited at the opportunity to showcase his 2013 wines with everyone and he told me what really made Forchir unique. He explained that the daily temperature fluctuations along with the local terroir of stones that washed down from the Alps is what gives the wines of Forchir its distinct fruit and aromas. He only brought to bottle what the climate and terroir had already handed him. He seemed absolutely at peace with that statement. The Forchir estate is one of the oldest estates farming in Friuli, with specific sites in the three areas of Felettis, Camino and Spilimbergo. White wine dominates Friuli wine production. 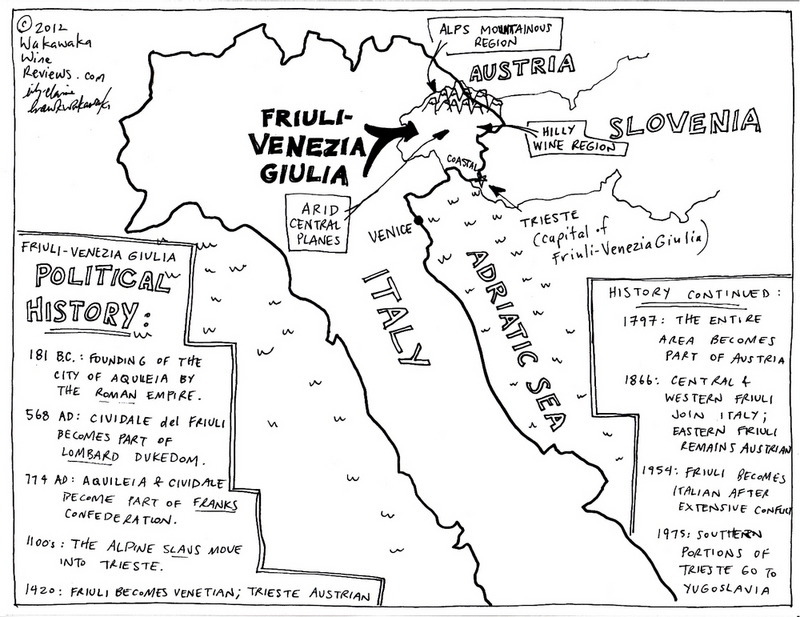 In the 1960s, winemakers of the Friuli-Venezia Giulia pioneered modern techniques for white winemaking in Italy by quickly getting juice off the grape skins and taking extra measures to prevent oxidation. Paolo explains that his emphasis is to showcase the grape's pure fruitiness and acidity without the masking affects of oak. Forchir's wines mirror the Alsatians and winemakers of the Loire Valley more so than in other parts of Italy. We all agreed the Tocai Friulano 2013 would be outstanding with Prosciutto from San Daniele and it has that classic, slightly bitter almond note that makes the green apple and peach pop a little more. It has a slight nutmeg note and more body than Paolo's Pinot Grigio. We hope to see Paolo again soon.